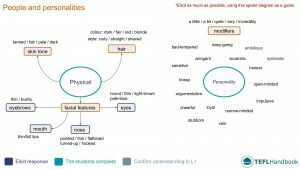 The first in our series of upper-intermediate ESL lesson plans focuses on the adjectives that we use when describing people and their personality traits. It includes a lead-in activity, several classroom exercises and a game. 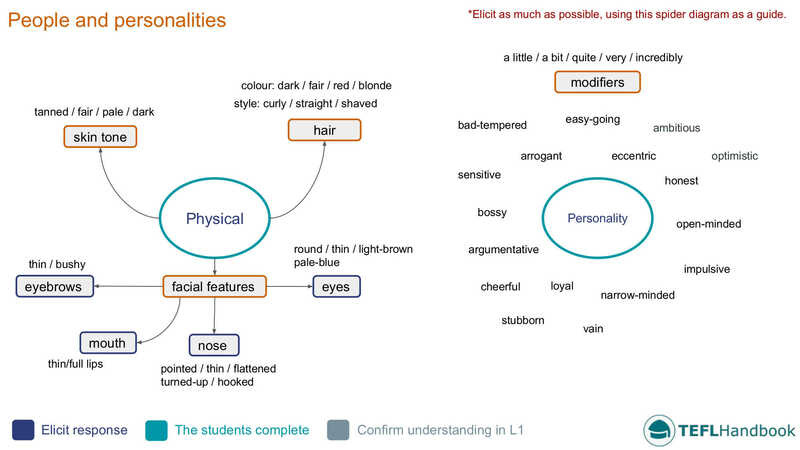 Elicit adjectives that describe different physical and personality traits. Add any to the board that you feel are relevant to the level. Use this spider diagram as a guide. Students will work in pairs to create a detailed description of a well-known celebrity. Start by dividing the class into pairs. Then, tell them that they have to choose a well-known celebrity and write a description. If you have used the sample board, encourage them to use as much of the new vocabulary as they can. They can use their smartphones to search for images or new vocabulary. When they have finished with their descriptions, each pair will read theirs to the group, who will attempt to identify the famous person. Students select adjectives for themselves and a partner and have to justify their choices through discussion. In the same pairs as the previous activity, students will select three adjectives that best describe themselves and three that they feel strongly match their partner. Inform them that they will be asked to explain each choice. When finished, each student will discuss their selections, then hear what their partner has to say. After a student has listened to their partner's thoughts, ask them to comment on them. Do they agree? Are they surprised by any of them? In this speaking activity, students will interview each other about their families. "Who do you take after?" Elicit its meaning and correct if necessary. To take after: to resemble a close, older relative. Next, tell the students that they are going to interview each other about their families, add the following prompts and try to elicit the type of questions they might ask and add them to the board. Do you look like/take after...? In what ways are you similar/different from...? Do you look like any of your...uncles/aunties/grandparents? When they are clear on the task, the students can take turns interviewing each other. They should be able to talk for between three to five minutes. This is a fun role-playing game where two students will pretend to be on a first date. For each round, you'll give one student three personality traits. Their partner must find out what these are by asking questions. The player who is acting has to do their best to convey these characteristics, without explicitly referring to them. Set a time limit for each round, one or two minutes should be enough. In the end, the interviewing student has three guesses. Give them a score out of three. The next free lesson plan is on the present perfect simple and continuous. If you've found these materials useful, be sure to check out our full list of upper-intermediate ESL lesson plans. For other levels, have a look at our complete selection of EFL - ESL lesson plans. If you use an iOS or Android device, try out the TEFL Handbook app. An ESL lesson planner for English teachers. It has a lot more content and gives you faster access to our ESL resources, making it easier to use in class.